Gold in name, gold in colour (maybe more green) and top-notch in quality Oro Bailen or Bailen Gold was my destination recently on the only grey day we'd had for months. I did a college drop-off and continued to the town of Bailen to the north of Jaen province, once famous for its ceramics and brickworks these days its gourmet olive oils that are making the town famous. Oro Bailen is one of over 300 olive oil mills in Jaen province which produces 50% of the Spain's olive oil and 25% of the world's olive oil and its sea of olives consists of over 66 million olive trees. 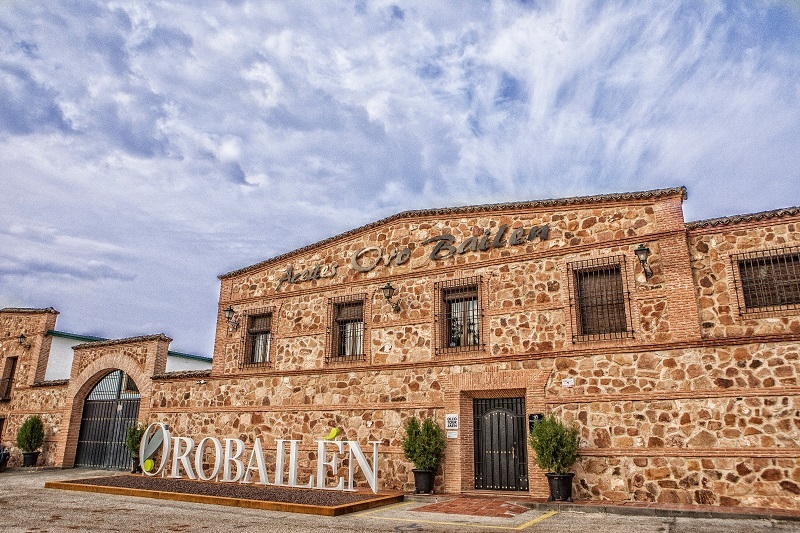 Oro Bailen has won many national and international awards for its Extra Virgin Olive Oils, it also produces Marmalades and Oil Pearl Capsules. The mill was an eye-opener for me, so clean and modern unlike some of the co-operatives around where I live. Oro Bailen is owned and managed by one family who also have their own olive groves producing all the olives that they process. The olive trees are looked after by specialists and harvested at their premium to produce fabulous rich, fresh oils gourmet oils. They grow two varieties of olives, Picual and Arbequina which produce two very different oils, ideal for individual food pairing. A tour of the factory is available on weekdays beginning with an explanation of the olive oil categories on the market and what make a virgin olive oil as opposed to and extra virgin olive oil. The whole process from harvesting as the grower, producer and bottler is done at the optimum time in such a way that the fruit can go from tree to bottle in only a few hours. The Picual olives are collected in the cool of the night as the trees are smaller and lower and can be harvested by one man and his machine and the Arbequina olives are harvested by teams with sticks and nets in the mornings. They come directly to the factory and are poured into enormous hoppers to be cleaned, washed and then to the milling process. Everything is very clean and each stage carefully controlled. From tree to bottle to the shop where you can purchase not only olive oil but their entire range of oils, marmalades and capsules and this is where the Extra Virgin Olive Oil (EVOO) tastings take place. The high point for me was seeing the two greeny-gold oils poured out for tasting. Each very different in colour and flavour. Starting with the Arbequina, more golden in colour, a smooth yet slightly bitter flavour with a touch of heat. It reminded me of a freshly peeled grass stalk when young and in England or the young, soft fresh green almonds a delight of spring here in Spain. The tasting notes said medium fruity with banana, apple, green wheat, almond and grass flavours. I did quite well on that one but I didn't get banana even an unripe one, but the sensation on the tongue was delicious. The Picual oil a more intense green colour and fruitier flavour was an overall taste bud pleaser, not so obviously bitter. I think I'm an EVOO convert and will now enjoy oil tastings (almost) as much as I enjoy wine tastings. It all depends on your likes and I liked the Arbequina best. My thanks go The Artisan Olive Oil Company who sell Oro Bailen's oils online and to Oro Bailen for my visit and the fabulous EVOOs I took away with me which won't be around for very long.